Seeing The Force Awakens a few days ago whetted my already keen appetite for all things Star Wars, so it was good to slake it on painting. The first miniature I tackled was Leia Organa -- we had to wait a full year from the introduction of Imperial Assault for Fantasy Flight Games to release a miniature for her. That's no way to treat a female lead, let alone a princess. At least our patience has been rewarded -- this is a lovely sculpt, with an insouciant pose that embodies the acid sweetness of Carrie Fisher's Leia. My only complaint is that the miniature's face was longer and finer than Fisher's own, requiring some remedial painting: enlarging the eyes, shortening the nose, and rounding the lips. I'm not sure if I captured Fisher's features, but it was the best that my brush could do. Another miniature I was overjoyed to see was Dengar. I've never been exactly clear as to why Dengar's head is swaddled in bandages. 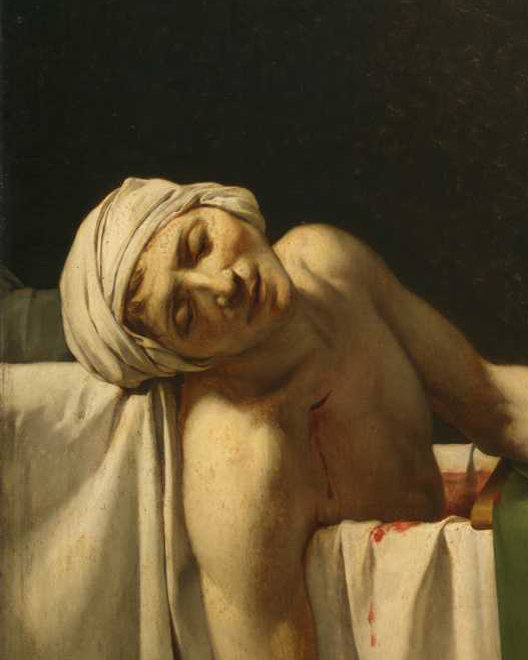 Maybe he has dermatitis herpetiformis, like Jean-Paul Marat. 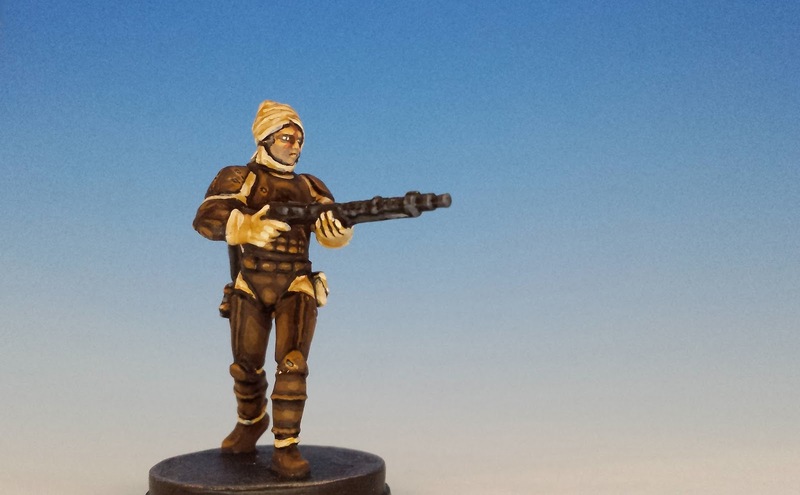 In any case, he (Dengar, not Marat) is one of the iconic bounty hunters and it was fulfilling to finally paint him. Intriguingly, Fantasy Flight Games decided to make Dengar a giant of a man. He towers over Leia. I really like the fact that there is so much height variation in the Imperial Assault miniatures -- it gives certain figures a real sense of menace. And menace is something that the Dengar miniature needs, since the figure strikes a mincing pose that makes him seem a little dainty. His stride is just a little narrow -- I wish FFG could have come up with a more dynamic pose. The next miniature is General Sorin, a non-canonical character invented for Imperial Assault. 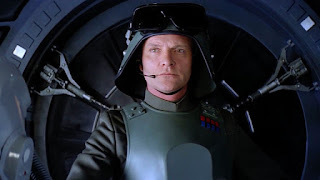 Fortunately, he's a dead-ringer for General Veers, the Imperial officer who led the attack on Hoth. Like Veers, Sorin wears AT-AT pilot armour, including a flaring helmet and a cuirass with life-support gear. The pilot armour is a visual cue to Sorin's special abilities and command cards when directing Imperial vehicles. I love Sorin's pose: simple, commanding and self-possessed. Not every miniature has to be brandishing a weapon in order to seize our attention. Without a doubt, this is a miniature that speaks in an accent of English Received Pronunciation. I can just hear him saying "Fyah!" And last of the figure packs is the Echo Base Troopers, aka Hoth Rebel Troopers. 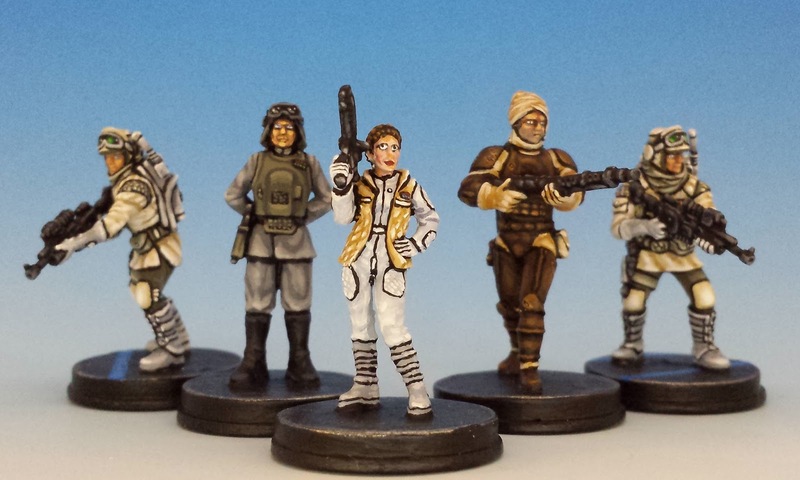 Like with Leia, painting these characters require a lighter shade of pale: whites, creams and light greys. Such a palate is extremely difficult to pull off, especially if (like me) you believe in a lot of black outlining. 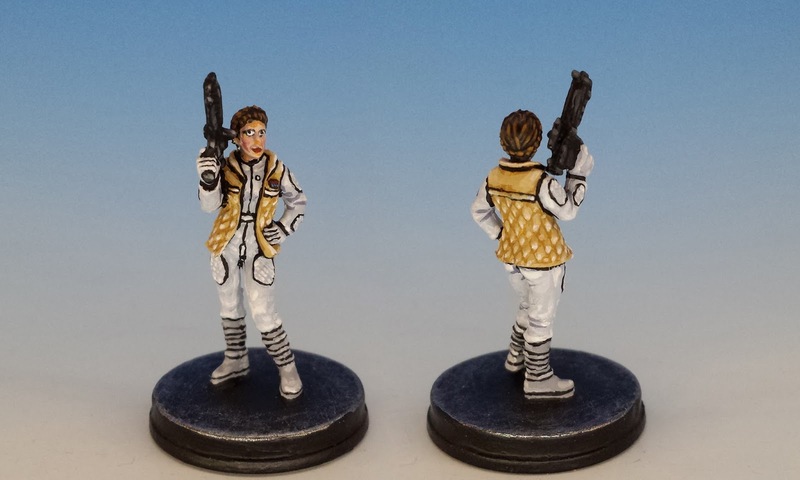 White garments aren't very forgiving when it comes to messy outlines, and in the case of these Troopers, the miniatures are covered in fiddly details (buckles, straps, holsters and piping) that required hours of work. I can't wait to get these miniatures on the gaming table. 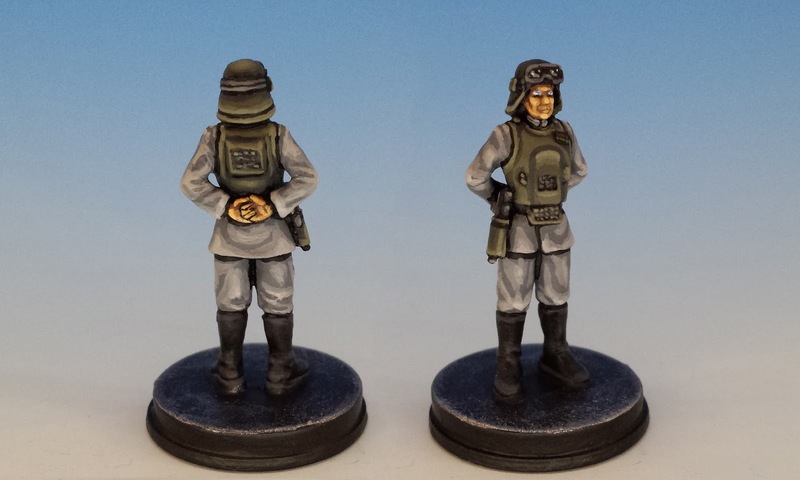 As befits her station, Leia is an especially powerful addition to the skirmish game. She's solid offensively and defensively, and boasts a new ability called "Battlefield Leadership". And all for just 8 points! She has the potential to turn any battle into the Rebel's favour. As Leia herself said, "I don't know who you are or where you came from, but from now on you'll do as I tell you, okay?" Watch out for future posts on the rest of the Return to Hoth miniatures. And in the meantime, I'm updating my galleries of the complete Imperial Assault Rebels, Mercenaries and Imperials. Thank for looking! By the way, I like the way you painted the X-wings for Armada. Those look awesome!! I was just watching ESB for the first time with my kiddos today. 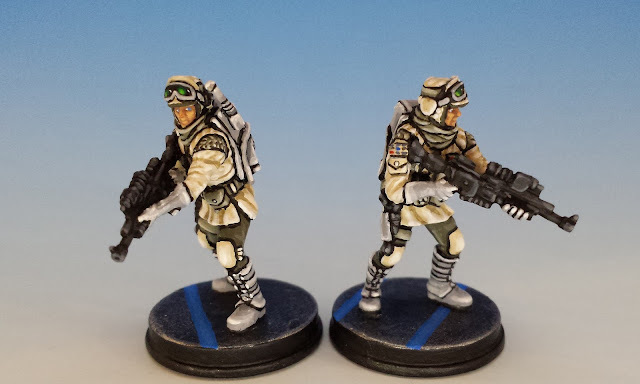 Do you mind sharing what specific paints, techniques you used to paint the whites on the Hoth troopers and Leia? Back in the 90s West End Games published Star Wars miniatures rules to go with their RPG. They released miniatures in partnership with Ral Partha I believe. I still have a dozen or more of them, including Dengar. I painted them as a teen, so my artwork wasn't fabulous, but I will have to post photos of them on my blog when I get a chance. I may even be inspired to give some of them a fresh coat of paint. Thanks again for your inspiring post! I'm really happy that these minis might inspire you, Andrew. I'd be happy to give you a run-down of how I painted Leia etc. Leia and the troopers were primed white. The white of Leia's jumpsuit is a basecoat of Vallejo Game Colour Wolf Grey (a very light bluish grey). Then I applied one highlight of 1:1 Wolf Grey and White, and one further highlight of pure white. Her boots had a basecoat of Vallejo Model Colour Light Grey, with increasingly light highlights. And finally her vest was (I believe) a basecoat of sand-yellow, with similar highlighting. Then I outline all the details in black. The Troopers got a similar treatment, with Light Grey for their boots, glove, holsters and backpacks. Their jackets were done in Game Colour Bone White, with a few layers of highlighting going up to White. In retrospect, Bone White was too dark of a basecoat, and it makes their coats look yellow rather than white... well, live and learn. Thanks Michal... I'm looking forward to seeing some more Imperial Assault miniatures out of you! Super stuff, especially the effort put into the Troopers! Thanks Barks! I was happy to see that you're painting up some Imperial Assault miniatures yourself. They look grand - your Boba Fett is superb. The blacklining makes these look almost cel shaded (think "Borderlands"). Thanks Allison! A couple of other people have mentioned that my minis have a cel shaded look. It's a very interesting observation... in fact, I'm starting to work on a post about it. 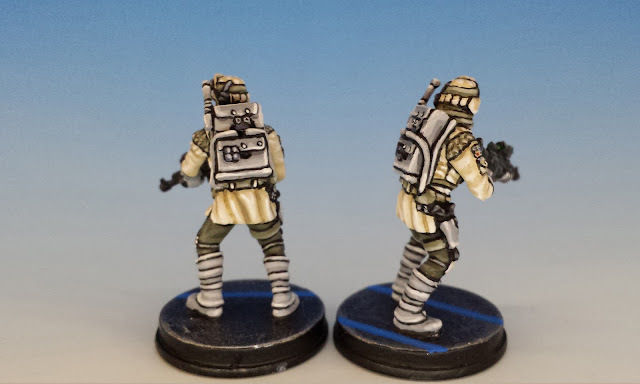 The rebel troopers are especially well done considering the amount fetal and muted palette.